At least 17 officials from Hunan Province have been implicated in a corruption scandal involving forged property documents, according to the Yiyang government. At a press conference held July 20, officials said a whistleblower exposed the scandal. It was alleged that land use permits and hundreds of property ownership certificates for an apartment complex were faked in exchange for money and other benefits. Built in 2000, Xiaoyuan Community in the city's Heshan district sold 902 apartments at 500 to 800 yuan ($77 to 124) per square meter on average, much lower than market value. 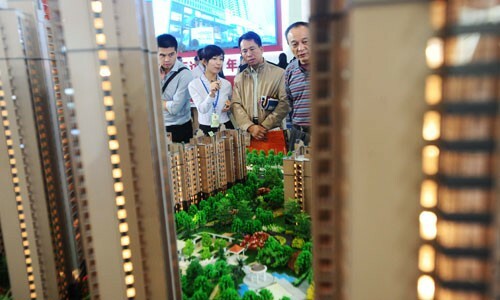 Nearly 800 apartment owners obtained property ownership certificates from the local housing management bureau with authentic seals, Beijing-based Legal Weekly reported Wednesday. But, when a Xiaoyuan apartment owner tried to mortgage his property in 2010, the bank told him the number of the property ownership certificate did not exist and reported the case to police, the report said. According to the Yiyang government, property developer Cao Jianhui obtained a land use permit illegally for Xiaoyuan and could not provide construction permits issued by the local government. Cao is currently in police custody charged with tax evasion and forging official documents and seals, Changsha-based Hunan Daily reported. The Yiyang government said 17 officials are suspected of participating in the case and police are investigating. Four have been dismissed from their positions without criminal charges. Despite the 17 suspects, some say it's the local government involved in deception. Retired Yiyang resident, Hu Zaihua, who claims to have close connections to local officials, told the Global Times on Thursday the local government is lying about the statistics regarding illegally used land for the Xiaoyuan development. "Given that Xiaoyuan built nearly 90,000 square meters of apartments, the community actually takes up 3.3 hectares of land, which is larger than the two hectares released by the local government," Hu said. Wang Gangqiang, deputy secretary of the Yiyang CPC commission for discipline inspection, said the case is still under investigation. Yiyang's government also promised to protect the legal rights of the apartment owners and taxation agencies are looking for money from the property developer, the report said. "I believe my property ownership certificate is authentic, as housing authorities recognize it and we can do nothing about the issuing process manipulated by the government," a Yiyang resident surnamed Li who owns a 142-square-meter apartment in Xiaoyuan community, told the Global Times on Thursday. Li spent 110,000 yuan ($17,082) on the apartment in 2007, and she plans to sell it at 200,000 yuan ($31,059) due to a money crisis. But, the local government has halted sales of apartments in the community since the investigation began, so Li could not finish property ownership transfer procedures. "I am confident my apartment will be sold eventually because government officials promised to fix the problem and protect the rights of home owners," said Li. Whistleblower Hu said apartment owners in the community have been warned by local government officials to keep silent regarding fake ownership certificates, and not to petition higher levels of government. "If local government pays the evaded land use fee and taxes, which will probably top 50 million yuan ($7.7 million), it will bring a huge loss for State assets," said Hu. Hu said abuse of power by local property authorities goes beyond the Xiaoyuan community, as he has evidence one of the arrested suspects has built 100 apartments in a different residential complex. He suspects the property ownership certificates for these apartments are also fake. Currently, only four officials have been dismissed from their positions. However, Li Taihua, director of the Yiyang Housing Management Bureau, was not dismissed and will soon be the deputy director of the Yiyang Party Publicity Department, according to the Legal Weekly report. "It's actually a promotion for Li to take the new position, which is ridiculous considering his dereliction of duty," said Hu. Xiao An, a Yiyang resident who also wrote a report to the Hunan provincial commission for discipline inspection to expose the problems in the Xiaoyuan community, questioned why nobody in the Heshan district government took responsibility for not discovering the problem. "City and district government, as well as land and resources bureaus, should be aware of these illegal activities over the past decade, but it's surprising that no officials from these government agencies are blamed for the numerous economic losses," said Xiao. "Government officials who helped forge apartment ownership certificates are suspected of abusing authority and could be sentenced to as long as seven years in prison," Chen Tao, a criminal law expert with the Beijing Lawyers Association, told the Global Times on Thursday. "Being fired from one's position is not enough for officials who abuse their power," said Chen.